Coconut water is found in young coconuts and is a good source of fiber, vitamin C and several important minerals. Magnesium: 15% of the RDI. Manganese: 17% of the RDI. Potassium: 17% of the RDI. Calcium: 6% of the RDI. Coconut water contains antioxidants that protect cells from damaging free radicals. Studies on diabetic animals suggest that it may improve blood sugar control. It's also a good source of magnesium, which may increase insulin sensitivity and reduce blood sugar levels. Water from coconuts may potentially prevent kidney stones by reducing crystal and stone formation. Studies suggest that coconut water may have powerful cholesterol-lowering properties. Coconut water may help lower blood pressure and potentially decrease the risk of blood clots forming in the arteries. Coconut water is effective at replenishing fluids and electrolytes after exercise. It is comparable to other sports beverages. Coconut water can be consumed directly from green coconuts or in bottles. Avoid brands with added sugar, sweeteners or flavors. Coconut water is a delicious, nutritious and natural beverage that is extremely good for you. When to have Coconut Water?? Early morning on empty stomach: There are several benefits of drinking coconut water on empty stomach, early in the morning. Lauric acid present in the coconut water can improve the immunity naturally, enhance metabolism and detoxify the body. 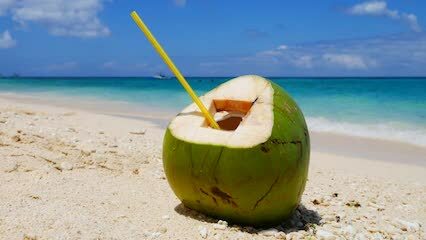 Before workout sessions/gym: Having coconut water before the workout sessions can ensure that the electrolytes lost during the workouts are replenished. Pre- and post-meals:Drinking coconut water pre-meals makes you feel fuller and prevents overeating and weight gain problems. Taking it post meals helps in quick digestion and prevents common problems such as bloating,nausea, loss of appetite and reduce inflammation as well. During pregnancy: It is safe to have coconut water during pregnancy in moderate amounts as it contains many minerals and vitamins. Coconut water curbs dehydration caused by morning sickness during the first trimester of pregnancy. Also, helps in constipation and heartburn problems during pregnancy. Coconut water should be taken as directed by your physician if you are suffering from following conditions.